The olm is indeed a very fascinating animal belonging to an ancient lineage of amphibians that are known to have evolved from the past 190 million years! 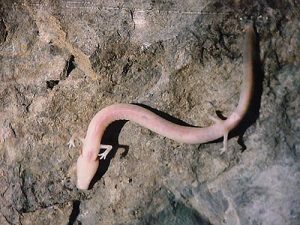 This blind, snake-like amphibian can be mostly found in the subterranean waters of the deep underwater caves of the Dinar Karst, Southern Europe. This species has ever so amused scientists and enthusiasts by its unique adaptations to a world of darkness in its underground habitat. The olm has a spectacular sense of smell and hearing. 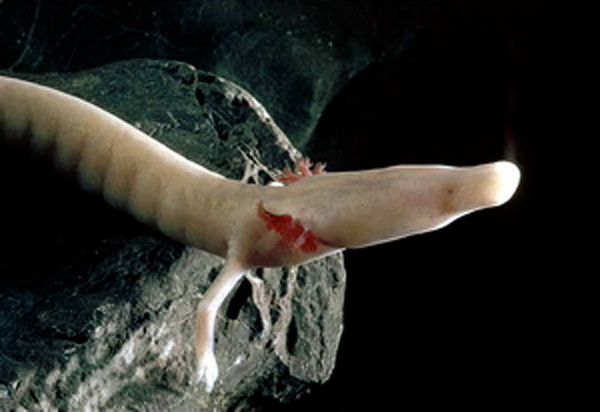 It is noteworthy that the olm is the only known species of the Proteus genus. The olm also happensto be the only exclusive European cave dwelling chordate. The olm is basically a blind cave salamander. Males and females look alike; the only distinction being the cloaca (urinogenital opening) of the males which is slightly thicker as compared to that of the females. It is also important to note that males are a little smaller than the females. 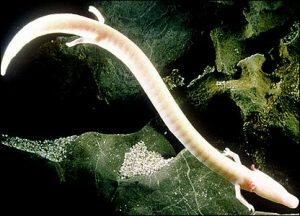 Size: The snakelike body of the olm is approximately 20-30 centimeters in length. There are many cases of some of these species reaching up to 40 centimeters. Color: Its outer skin appears to be yellowish-white or pink in color, due to the presence of a small amount of the pigment riboflavin. However the abdominal part of this creature’s body is transparent enough to make the internal organs shiningly visible. The fact that the color of its body is similar to that of the white humans is what earns it the term ‘human fish’. The olm’s skin begins to turn dark when exposed to light; this is due to the melanin content produced by the olm’s skin. Head: It has a pear-shaped head with a rounded snout. One will also notice a small mouth opening exposing tiny teeth. Its teeth form a sieve that helps keep the large food particles inside its mouth. Eyes: Olms have poorly developed eyes that happen to be covered by a thin layer of skin. Gills: The external gills of the olm are a distinct feature. 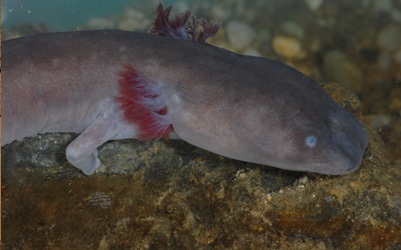 It has 3 pink gills placed on each side of its head; this amphibian breathes through its gills. Olms do have respiratory lungs but it does not have a major role in the process of respiration. Limbs: The olm’s limbs are not only small but are also equally thin. It is also interesting to note how there are fewer digits as compared to the rest of the amphibians. This species has three digits on the front leg and two on the back ones. This is considered to be rare among amphibians that generally have 4 digits on the front leg and 5 on the back ones. Tail: Its short, flat tail is surrounded by what appears to be a thin fin. Olms prefer to dwell in deep underground water systems especially in karst formations. For those who do not know, karst formations are actually geologic formations that occur by dissolution of a layer or several layers of soluble bedrock. These karst systems are generally formed in limestone and dolomite rocks. This amphibian of the dark is also found in caves and abandoned mines. It is necessary to note that these species prefer water temperature ranging from 6ºC to 12ºC. However, the case is quite different for the black olm that prefers warmer surface waters. These creatures can be found in varying water depths including near to the surface water levels and up to 300 meters underground. It is not unusual to spot these species near cave entrances, during periods of excessive rainfall. The species are mostly found in the Isonzo-Soca River in Italy, southern Croatia, southern half of Slovenia and also certain parts of Bosnia and Herzegovina. The popular sub species namely the black olm can be traced in Bela Krajina and southeast Slovenia. The carnivorous diet of the olm chiefly comprises of insects, small crabs and snails. It is observed that these species wholly swallows its prey and does not reside to chewing. Moreover, olms have a special ability that allows them to manage without food for prolonged periods of time. It can consume food in large amounts and store it in its liver in the form of lipids and glycogen. This cave salamander is gregarious in nature. As such it is commonly spotted forming pairs and groups alike. The sexually active males tend to be an exception; they establish and defend territories in which they attract females. In the course of defending their territory the males act aggressively towards each other, but the fights may only involve displays. By now, we already know that olms have undeveloped eyes that lie embedded below the dermis of its skin. As such it is not possible for these essentially blind animals to rely on their vision for survival contradictory to most amphibians and animals. This also explains why it is characteristic of their habitats to be almost completely dark. However, it is highly noteworthy how the sense of smell and hearing is more advanced and developed in these species, when compared to other animals. Let us take a closer look at the powerful sensory organs that make this species so interesting. The inner ear of this amphibian is specially designed with sensory epithelia that help them to receive sound waves originating from water. They can also perceive vibrations that emit from the ground. Research also shows the probability of these species having the capacity to sense magnetic fields that may as well include the Earth’s magnetic field. Certain findings also reveal that olms have a special kind of sensory organ in their heads. It is on part of this very organ that these species are able to sense electric fields produced by animals like sharks. Olms do not have any specific breeding season; as a matter of fact they may breed any time of the year irrespective of the season. During breeding, it has been observed that some of the smaller males tend to get aggressive with each other thereby defending their territory. Males are known to produce a pheromone that helps in attracting the female. If a female happens to enter a male’s territory, the male starts to perform courtship displays whereby it will beat the tip of its tail rapidly against its flank. In response, the female also tries to touch the male’s cloacae with her snout. Soon the male starts to move forward in a twitching kind of motion and the female also follows the act right behind the male. The actual act of mating thereafter involves the male releasing his spermatophore inside the female’s cloacae. Observations have revealed that such courtship displays are carried on and repeated several times in a day. These species are oviparous; as such females can lay up to 70 eggs. These eggs are laid typically undera stone or in between rocks. The female guards the eggs until the hatching time. Usually 1 or 2 eggs develop inside the female’s body and she very well gives birth to developed larvae. The tadpoles that hatch out of the eggs are approximately 2 centimeters long. In aperiod of 4 months they begin to look like adults; however, it is important to note that they become sexually mature only after a period of roughly 7-14 years. Olms can survive without food for prolonged periods that can even be more than 10 years! This species is a major symbol of Slovenian natural heritage. It islao depicted on one of the Slovenian tolar coins dated many years ago. A famous Slovenian science agazine was named ‘Proteus’ after the olm. An old Venetain stone fountain also happens to bear the symbol of two pairs of snakes with wings inspired by the olm that is beleved to have originated from Karst. In the literary work of ‘The Glory of the Duchy Carniola (1689) by Janez Vajkard Vavasor, the olm is mentioned to be a baby dragon. Olms enjoy a long life span of up to 58 years and more. The olm is enlisted as a vulnerable species by the IUCN. One of the major factors responsible for reduction of the olm population is believed to be water pollution. Toxic industrial waste and agricultural waste have always polluted water causing risk to the population of pecies like the olm. Here are some pictures of this weirdly interesting species called the olm.